Companies tend to minimize the impact of writing a meaningful proposal cover letter when bidding on government contracts. As a result, the source selection team does not feel the excitement in wanting to find out more about what you have to say in the rest of your proposal. The importance of know how to write a proposal letter is no different than when an applicant submits a cover letter for new employment. 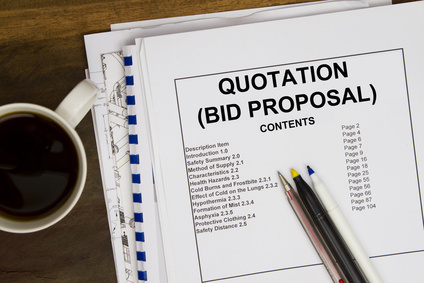 Your bid proposal letter for contract proposals should create a first impression to the contracting officer and source selection personnel. When you create a proposal letter for a government contract RFP, it should not be perceived as canned or templated. Cover letters should briefly touch on what the government expects to see in your proposal, an introduction of your company and any named subcontractors or teaming partners. If you are submitting a teaming agreement, your cover page should mention it and give a brief statement about the teaming partner’s history and how it will contribute to this effort. Your proposal letter should be brief but discuss the main points of your proposal. A brief point about your understanding of the agency’s mission can keep the government’s attention. What Points Should You Consider in Your RFP Response Cover Letter? Provided a short summary of your quality control approach and show how it minimizes the risk of non-performance to the agency. If you have a unique approach with best practices, then briefly mention it. Main players and what they bring to the table – include teaming partners: This is your chance to make a first impression. At best, the proposal response letter should address the basics of the expected evaluation criteria. Briefly telling the government about your leverage in the industry can be included. Tell the agency about your success in performing similar contracts; emphasize your focus on minimizing non-performance risks and how your qualify control approach has served you in the past. Tip: Your proposal letter should not be more than two pages. DO NOT included pricing information. Does the Government Really Read Your Proposal Cover Letter?Federal government contracting agencies read everything in your RFP response—including your proposal letter. Just as an employer reads an applicant’s cover letter, so too does the agency look at your letter. Tip. Never try to include information in your RFP response cover letter where the RFP itself expressly excludes information. An example would be discussions of additional past performance references in attempt to add more than the required amount stated in the solicitation. The ultimate purpose of your RFP response cover letter should be to grab the government’s attention. Getting to the main points is essential. It should speak the government’s language and immediately get to what you have to offer. An example of a sound proposal letter for federal government contracts is to briefly speak to the agency’s mission. A little research should get you this result. In fact, a sound technical proposal should also tie in your approaches to the government’s mission. Another valuable point is that you may want to inject is the level of clients you have performed contracts for (both commercial and governmental). Your RFP proposal letter should not be soaked with language about your commitment to customer service. This is too templated. Although this is important in the commercial sector, when it comes to government contracting your letter will sound like every other bidder. If your company seeks outside help to maximize the impact of your RFP response cover letter for contract RFP response and to increase your chances of getting the award, call our government consultants at 1-866-601-5518. FREE INITIAL CONSULTATION.